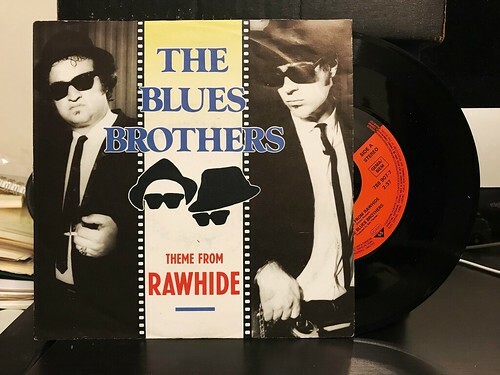 When I started digging into information about Blues Brothers singles, this was definitely one of the more surprising discoveries I came across. I didn't expect to find that "Rawhide" had ever been released as a single from the soundtrack album. I could see it perhaps making an appearance as a B side, but not as an A side picture sleeve. Yet here we are. I've always loved this song, mostly because it gave Elwood a showcase; something I always wanted when I was a kid. Elwood was my favorite and yeah, he drove the car in the movies, but he wasn't as in the forefront on record. "Rawhide" was one of the rare instances where he took center stage, never mind that it was just a theme song to a TV show I had never seen. The B side on this one is "Jailhouse Rock," which I'd really expect to be the A side. That song will get its chance next time. The artwork on this is interesting. Again, they are pulling from the same batch of stock photos that keep turning up, though this time they've taken the Briefcase Full of Blues album cover, split it in half and then switched Jake and Elwood to the opposite side. The film strip imagery cutting down the middle is a nice touch. I don't mind the recycling of photos as much when they do something interesting with it.